With retroX, fos4X offers a stand-alone retrofit solution for digitizing and improving the efficiency of existing turbines and supports operators for potential extended operation after the expiration of the EEG subsidy. retroX will be available for different turbine types (multi brand) from Q2 2019.
retroX is a manufacturer-independent, stand-alone solution that works without direct integration into the turbine control system. 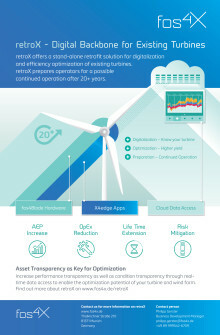 Individual turbines, as well as entire wind farms, can be digitally integrated into a cloud-based IIoT environment. In addition to providing turbine data in the fos4X cloud platform, integration into existing management software is also possible. By using the standardized fos4Blade sensor platform, the initial investment for retroX is extremely low. Additional modular, digital optimization packages form a flexible and holistic solution. For the first time, an economically sensible retrofitting of existing turbines in their second decade of design-life is made possible. 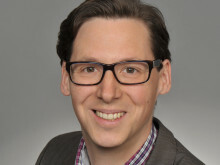 retroX prepares operators of wind turbines optimally for the upcoming assessment of the extended service life of wind turbines. Through the long-term recording of load data and its extrapolation, a plant-specific load history is created over the entire operating life. Previous conservative load assumptions for the calculation of the remaining service life are supplemented by qualified and reliable data. Prior to publication, it must be approved by fos4X. 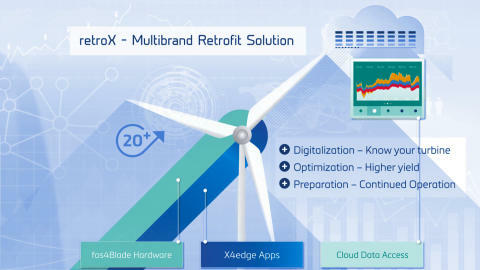 retroX offers a stand-alone retrofit solution for digitalization and efficiency optimization of existing turbines. retroX prepares operators for a possible continued operation after 20+ years.